Two years ago Jordan Peele shook up the horror genre with Get Out, a film that was as socially-aware as it was scary, as funny as it was unflinching, and it earned him an Oscar win to boot. The expectations have been through the roof for his followup, the simply-titled Us, which has been described as Peele's "new nightmare" inspired by a favorite episode of The Twilight Zone. And again Peele is back exploring humanity's ills through the lens of horror, specifically the divide between us that will surely lead to our downfall. Or it's just a home invasion movie with a twist. Take your pick. Peele never liked the "social thriller" label attached to Get Out, a term that only got muddier when it landed in the comedy/musical category at the Golden Globes. He's on much firmer genre territory with Us, but tackling serious issues and confronting tough truths remain a point of interest for the filmmaker, although he does so less successfully this time while his skills at eliciting frights have never been sharper. Us begins in 1986, a year that saw more than six millions Americans lock hands in a publicity stunt called Hands Across America, a charity benefit meant to fight homelessness and poverty. How'd that work out? Peele seems to be asking that question as his camera looms over the boxy TV set showing an ad for the big day, meant to be a personification of unity in fighting a common cause. It's at this same time that young Adelaide Wilson (Madison Curry) becomes separated from her arguing parents while on the Santa Cruz boardwalk. The girl wanders into a Vision Quest hall of mirrors and encounters her doppelgänger, Adelaide's face widening into a shocked stare fans of Get Out will recognize immediately. Years later and an adult-aged Adelaide (Lupita Nyong'o) is still traumatized by the fifteen minutes she was lost. She's still a little bit off, but she tries to keep it together for her family: husband Gabe (Winston Duke), daughter Zora (Shahadi Wright Joseph), and son Jason (Evan Alex) who seems to have picked up some of mom's peculiar tendencies. He never goes anywhere without his Chewbacca mask, and has trouble communicating socially, even with his own family. Her anxiety and his only get worse when the family's summer vacation to Santa Cruz is turned upside down by the arrival of four malevolent doppelgangers dressed in bloody red robes. Peele explores the idea of human connection, or this country's lack of it, and the hopelessness that has been allowed to fester for far too long. There is a widening split between those who have everything, and those with nothing forced to exist in the shadows. When Adelaide asks her crimson twin who they are, she simply replies "We are Americans.". The crowd at our screening laughed at that one, not because it was funny but because it was true. The problems of this world are ours, and the ramifications of our apparent disinterest are also ours. We reap what we sew. Peele dabbles in this and other ideas without committing to much of anything, which can be frustrating because there's potential in further exploration. The #MeToo movement and the push to believe women is touched upon as Adelaide struggles to convince Gabe of her childhood traumas. Much of the conflict between the couple seems to stem from his insistence on being the man-in-charge, even when she is proven to be more than capable of taking care of business. There's dread hanging in the air right from the start, and Us really finds its footing as Peele plays within the boundaries of the horror genre. The home invasion sequence is a thing of nerve-racking beauty; it stretches on for so long you begin to feel terrorized by the dark copies. Peele's sense of humor never wavers, though, catching you off-guard with a visual gag or a darkly-ironic slip of the tongue. It truly feels as if anything can happen and that anyone can be a victim of this mad mirror attack, while Peele's use of light and music (The use of an iconic old school rap song during a murderous sequence is perfectly-timed to be both hilarious and ominous. Don't let anyone spoil it!!) tie your senses into knots. While Us isn't awash in extreme violence it only makes the bloodshed all the more impactful and tough to shake. Like he did with Get Out, Peele has crafted images that will be seared into memory long after Us has left theaters. Nyong'o may have found her calling as a horror scream queen. Following her heroic turn in the horror-comedy Little Monsters, she takes on a physically-demanding dual role in Us. All of the cast pull double-duty, including co-stars Elisabeth Moss and Tim Heidecker, but it's Nyong'o who stands out from the rest. She shifts from heartwarming and gentle to terrifying and cruel in a moment's notice, while finding something maternal within both characters. Duke is great as comic relief, masking that animal side we saw in Black Panther under a hail of jokes and offbeat behavior. Peele gets the most out of them and I wouldn't be surprised if he made an effort to work with them all again. Us is going to mean different things to different people, and should inspire loads of discussion over repeat viewings. 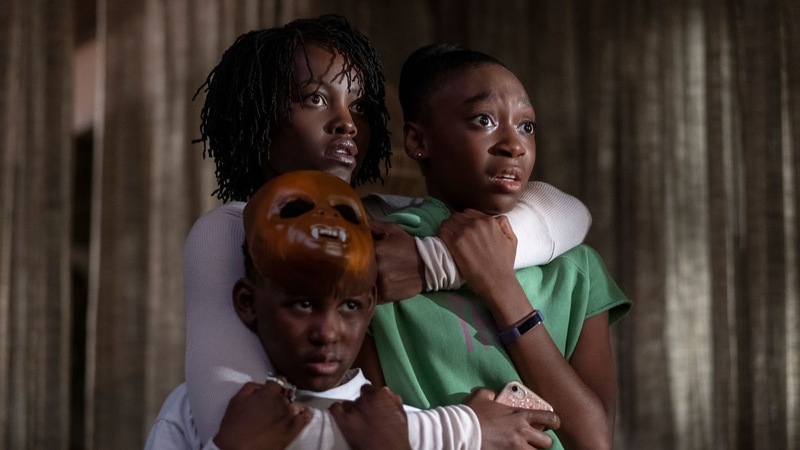 Whether you go in looking to be scared or to experience something more, Peele has delivered on another twisted crowd-pleaser that promises to be dissected for years to come.